Note. Yandex Zen is not only integrated with Yandex Browser for desktop, but also with the mobile browser for iPhone, iPad, smartphones and tablets based on Android. Read the Zen article in Help to find out how to enable or disable Zen in your device's mobile browser. Yandex Zen recommendation engine generates a recommendation feed that is gradually adapted to your interests. It analyzes your interaction with the feed based on your subscriptions, ratings and material you choose to hide within the feed. Also, it takes into account your search queries, browser history, and other data on your online preferences. The data is stored anonymously, so you don't have to worry about your data privacy. As a result, you receive individual recommendations that include materials from sites you haven't visited yet. If your interests change, the Yandex Zen feed adjusts to them after a while. To refresh your recommendation feed, go to the Yandex Zen tab and click New posts or press F5. To unsubscribe from a channel, on the Zen website go to the Subscriptions tab. Open the needed channel and click Unsubscribe. If you subscribed to a channel, this does not mean that the feed will display all its publications. Zen will filter out a channel's publications that don't match your interests. In addition, it will display publications on similar subjects from other channels and sites. Open the Zen website and go to the Channels tab. In the pop-up window, type in a topic in the search bar, like “humor” or “cats”. Select the topic you want from the list (the topics are shown above the list of channels). Open the topic and click Subscribe. To unsubscribe from a topic, go to the Zen website and open the Subscriptions tab. Open the topic and click Unsubscribe. If you have subscribed to a topic, this does not mean that all publications related to this topic will be shown in your feed. Zen will just show more publications on your chosen topic. Photo. To change your photo in the comments section, click the icon displayed above the image in the account. Until you add a photo to your account, your comments will display a randomly selected image, e.g. . Note. The recommendations feed is turned on by default. Go to the Appearance section. Clear the box labeled Show Zen — your personal recommendations feed — in new open tabs. Turn on the option Show Zen — your personal recommendations feed — in new open tabs. In the Yandex Zen section, click Enable. Select at least five sources of interest to you. Open the Zen website and make sure it works. If the site is unavailable, this indicates a systematic crash of the entire service. Wait until Zen is back. 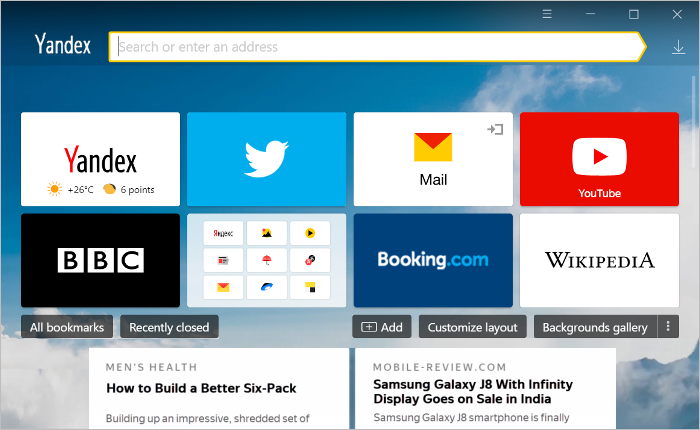 Check whether the Yandex Browser option Show Zen — your personal recommendations feed — in new open tabs is turned on. Make sure you have installed the latest browser version. Install an update, if necessary. If the feed is still not displayed, contact our support staff using the feedback form. Make sure you have logged in to Yandex under the same account on all your Zen devices. If you are logged in but still have to set up your Yandex Zen feed from scratch every time you launch the browser, then check whether cookies are disabled. Yandex Zen uses your history of visited sites to generate your recommendation feed. If you are not saving cookies, then Zen is not able to collect your information for analysis.